BookingCenter PMS | Owner's Module | Manage bookings, expenses, payments and reporting of units by "Owner"
Manage bookings, expenses, payments and reporting of units by "Owner"
The Owner’s Module allows management of Rooms or Units by Owner by tracking commissions, payments, expenses and generating reports. Each Owner can be assigned to multiple units with a specific commission rates. Track bookings, room rent, charges by unit and owner. Manage expenses and commissions with Owner Statements and Reports. Owner log in view bookings, generate statements and track transactions for their units. Manage payments to each Owner and track expenses by unit for example, a fixture repair and the entry is made and applied to the Unit on the date the service was performed (or to be ‘billed’ to the Owner, back-dating and forward-dating is allowed). Because many property management companies pay Owners on a regular basis for bookings generated through their properties, we use our Agents feature to track Owner payments. Create detailed reports of bookings by arrival date, source, agent and more: Perfect for providing a list of bookings per Owner. Run reports at the end of a month or fiscal quarter to report on all bookings – and the financial summary allocated to the bookings – per Owner based on the Rooms identified as ‘owned’ by the Owner. A manager can add ‘Transaction Categories’ which are categories of expenses that are applied against revenue as ‘debits’ or expenses. 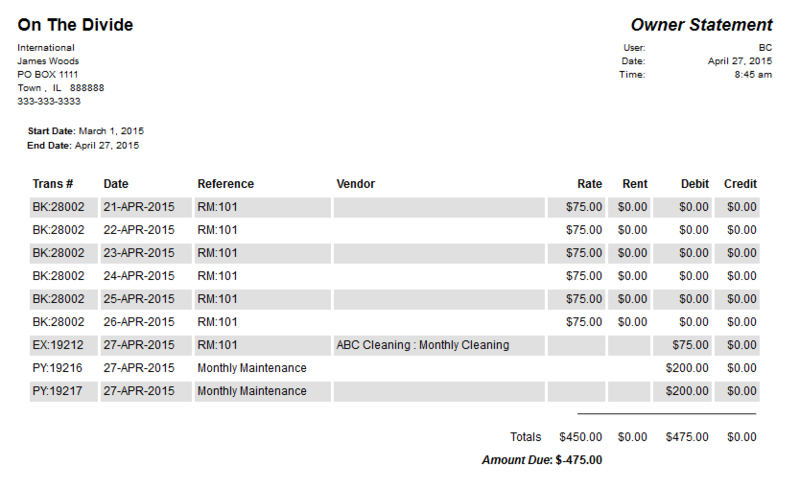 Manage payments to each Owner and track expenses by unit. Because many property management companies pay Owners on a regular basis for bookings generated through their properties, we use our Agents feature to track Owner payments. Below is an example of an Owner record with the historical bookings paid to that owner by receipt date and number. Print out specific Owner Details on the Booking Confirmation This enables the Confirmation letter to provide property-specific driving address/contact details so that a specific confirmation letter can be sent for each booking based upon the actual Room booked; sent as a fax, letter, or via email with one-click.